Although the Himalayan arc is dominantly a contractile thrust belt, significant amounts of arc-parallel extension and translation have taken place since the Miocene. We (myself, Mike Taylor, Mike Murphy) test the prominent models for arc-parallel extension and translation, and find that the along-strike variations in convergence obliquity between India and the Himalaya best predicts the geologic and GPS geodetic observations. Active structures and focal mechanisms of the Himalaya and Tibet. Over the past 25 years, there has been significant recognition of major, active arc-parallel extensional structures in the Himalaya, dominantly the Leo Pargil, Gurla Mandhata, Thakkhola, Kung Co, Ama Drime, and Yadong Gulu rifts. Some of these (LP, GM, AD) are the Himalayan/Tibetan version of metamorphic core complexes (and the differences between these and the Cordilleran version will be discussed here in the future); the others are major graben cutting the High Himalaya. The western ones (LP, GM, Thakkhola(?)) bear some relationship to the Karakoram Fault, a sub-orogen-scale strike-slip fault that accommodates dextral shear between the NW Himalaya and the western Tibetan Plateau. 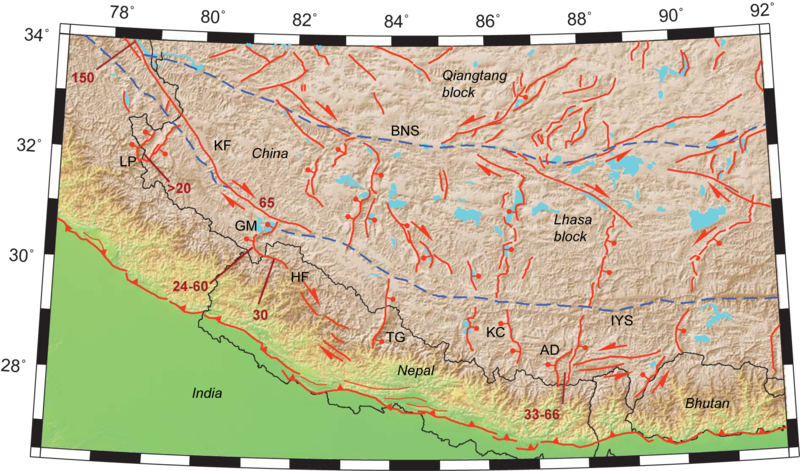 In particular, right slip along the KF seems to step south at GM and into the High Himalaya; this interpretation (spearheaded by Mike Murphy) has GM being a releasing structure on the KF-Humla fault system, and probably accommodating the ~30 km slip differential between the those faults. Importantly, offsets along the KF decrease systematically from ~150 km in the NW to ~50 km in the SE near Mt. Kailash; the Himalaya to the SW is extending, but Tibet to the NE is not (in the vicinity of the fault). This indicates that the KF is accommodating differential extension of the Himalaya relative to Tibet. Active structures of the Himalaya and south Tibet. Numbers indicate magnitude of fault slip (km). It is also clear from published GPS data that the convergence direction between India and the Himalaya remains pretty consistent, even though the strike of the Himalaya changes dramatically (by about a radian) over its ~2500 km length. A look at the arc-parallel component of the GPS vectors (Eurasia-relative) shows dramatic arc-parallel spreading away from the center of the range (suspiciously close to Everest). This also leads to an increase in arc-parallel dextral shear from the central Himalaya to the NW, though the picture is complicated by plate boundary changes to the east. Shortening across the range somehow manages to stay pretty consistent along strike, even though the magnitude of the velocities involved decreases by a factor of two from Everest to the NW. Arc-parallel GPS velocities (relative to Eurasia) from a variety of sources. 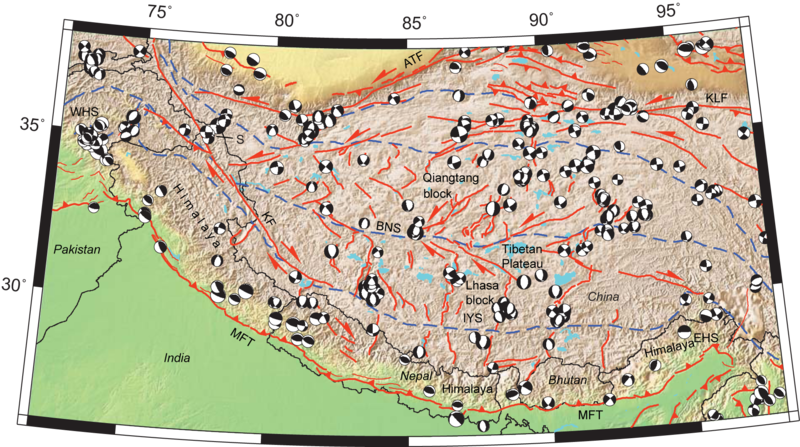 The major models explaining aspects of Himalayan and Tibetan deformation that we tested are radial spreading of south Tibet, variably-oblique convergence between India and the Himalaya, oroclinal bending of the Himalaya, and east-directed, lateral extrusion of a quasi-rigid Tibet. The only hypothesis not rejected by fundamental observations was the variably-oblique convergence model, as suggested by McCaffrey and Nabelek (1998). 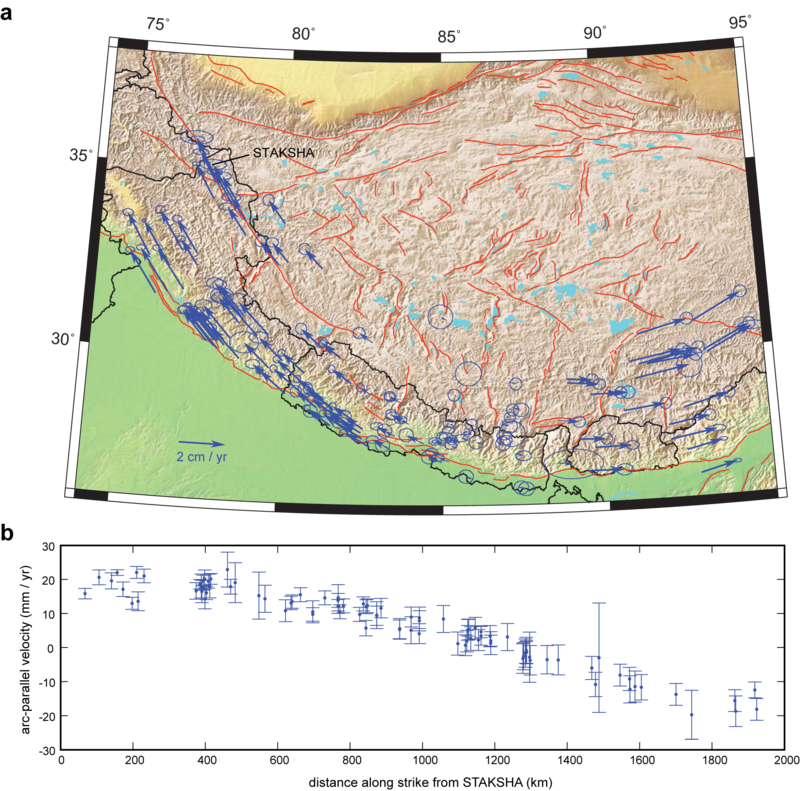 Radial spreading isn’t supported by the N-S contraction of the entire Himalaya and Tibet observed geodetically, and lack of mapped structures capable of accommodating this deformation (the South Tibetan Detachment is cut by the structures accommodating arc-parallel extension, and its activity coincided with Main Central Thrust activity, so it could not have contributed to an areal increase in the Tibetan Plateau). Active oroclinal bending requires E-W contraction of the Himalayan hinterland and S. Tibet and/or left-lateral shear in the western Himalaya/S. Tibet and right-lateral shear in the east (flexural folding); the opposite shear sense is observed in both cases. And finally, lateral extrusion requires active dextral shear across the whole northern margin of the Himalaya, at a fairly good clip, and this is simply not observed east of the KF. Questions and comments are welcome. I can send a copy of the manuscript although I’m not sure if I’m allowed to put a link to it.